There are many creative small bathroom ideas and design tricks that can be applied to make the most of a small space and to make that space seem generous. One of the most effective ways of blurring the boundaries in a limited space, is to use light cleverly. Natural light especially, can do a lot to open up a space - even if it's just a narrow vertical band of glass bricks allowing natural light as in the small bathroom pictured above right. And what if your bathroom does not have windows and adding a skylight is not an option? How Can I Add Light to a Bathroom? 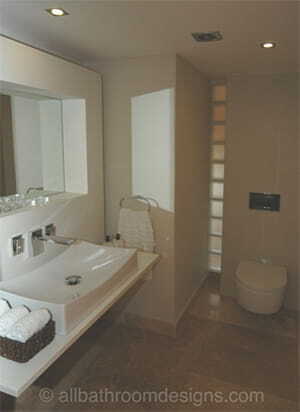 A bathroom located away from outside walls need not be deprived of natural light. A clever design solution not only brought light into this small master bathroom, but it also added a beautiful decorative element. The wall between the bedroom and bathroom draws its inspiration from the Japanese Shoji screens. The opaque laminated glass lets in ample natural light, yet it ensures total privacy. At most, a silhouette of another person can be seen from either side, adding mystique and a sensuous and romantic touch. At night the lights can be turned on in either room, turning this glass wall into a dramatic lighting feature. 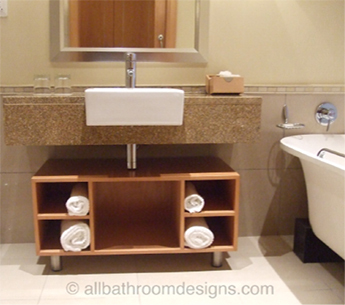 Small bathroom ideas such as this won't break the bank either! Note: Skylights can also dramatically increase the sense of space as well as provide ventilation - an excellent solution if it is practically feasible and within your budget when you plan a small bathroom remodel. Another way to visually increase the size of the floor is to lift fixtures off the floor. 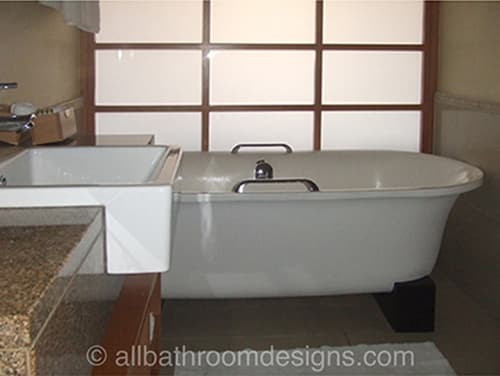 In this small bathroom both the vanity and tub are raised, which appears to reduce their footprint, allowing the eye to continue along the floor. The bathroom decor follows design principles often recommended for small bathrooms: Simple and light bathroom colors that recede - rather than bright or strong colors which would come forward and make the space more enclosing. Even the finishing accent tile strip is simple and understated. The advantage of small bathroom designs is that you can really splash out a chunk of your budget on one beautiful element, which can be the focal point and set the tone for the entire space. It may be a beautiful vanity, deep soaking tub or sky-light. Or it may be those exquisite designer bathroom tile designs that can transform a small bathroom into a jaw-dropping space. And finally - Two more space saving features in this bathroom: A corner shower with a curved front and a pocket bathroom door that does not intrude into the space. Look at adjoining rooms and steal space or light!